While flying is obviously the quickest and easiest way to get from the coastal capital of Lima to the high-jungle city of Tarapoto, adventurous travelers might want to try one of the two overland routes when traveling to these Peruvian cities. Star Perú—one or two flights daily. The flight is straightforward. You’ll need to check in at least an hour in advance (the airlines recommend two) at either airport. Lima’s Jorge Chávez International Airport is large but easy to navigate; Tarapoto’s Guillermo del Castillo Paredes Airport is tiny, so you won’t have any problems working out where to go. 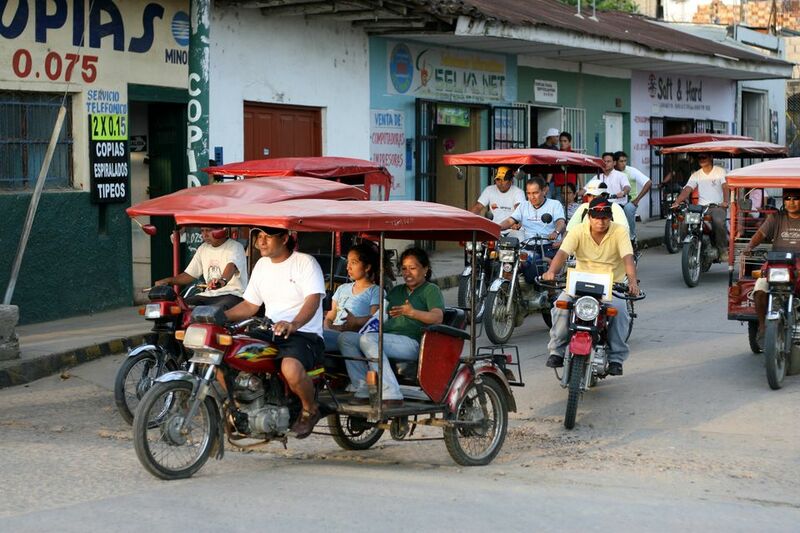 When you exit the airport in Tarapoto, you can hop on a mototaxi to the city center. Rates to various parts of the city are listed on a board just outside the airport. The standard bus route from Lima to Tarapoto heads along the north coast of Peru, passing through Trujillo and then onto Chiclayo. From Chiclayo, the route cuts inland in a north-easterly direction, then heads directly east through the small towns of Bagua Grande and Pedro Ruiz before reaching Moyobamba and then Tarapoto. As a side note, you can get to Chachapoyas (for Kuelap Fortress and Gocta Waterfall) if you turn off in Pedro Ruiz and head directly south. The bus trip between Lima and Tarapoto takes a whopping 28 hours on average, give or take a couple of hours depending on things such as weather and road conditions. Three of Peru’s larger bus companies offer a direct service along the route: TEPSA, Civa, and Movil Tours. A handful of smaller bus companies also run along the route, but it’s worth paying a little extra for one of the more established operators. If you’re traveling slowly and want to break up the trip along this route, you’ll find some interesting places to stop for a day or two. On the north coast, you can stop in Chiclayo, with its archaeological sites and excellent museums, and/or Trujillo, which also has archaeological sites, an impressive colonial city center, and great food. Further inland, you can take the short detour to Chachapoyas or stop in Moyobamba for orchids and a dip in the hot springs. The second overland route between Lima and Tarapoto avoids the coast entirely. This route heads directly inland in a north-northeasterly direction from Lima to Cerro de Pasco and then Huánuco and Tingo Maria. From Tingo Maria, head north along the scenic Tingo Maria to Tarapoto Road, winding your way through the high jungle and through towns such as Tocache and Juanjui before arriving in Tarapoto. If you’re lucky, this route can actually be quicker than the more standard route along the coast and inland via Chiclayo, even though there are no direct buses. A bus from Lima to Huánuco takes about 12 hours, followed by a couple of hours by bus or shared taxi from Huánuco to Tingo Maria. Smaller regional bus companies operating between Lima and Huánuco include Leon de Huánuco and Transmar. From Tingo Maria to Tarapoto takes about eight hours. The total travel time is potentially about 22 to 24 hours—at least four hours shorter than route one option. Of course, you’ll probably have to change vehicles at least twice, maybe four times, so this can easily add on a few hours while you wait for the next stage to start. You also have to be aware of potential problems along the Tingo Maria to Tarapoto Road. This road is improving each year, as more sections are being paved. The once-crumbling bridges over the Huallaga River—some of which had been closed to traffic and replaced by basic pontoon ferries—have also been rebuilt or replaced in the last few years. Unfortunately, old-school banditry does still occur along this route, mainly during the night. Daytime travel is fairly secure, especially if you go with a car service such as Pizana Express. Many people travel to Tarapoto with the intention of then heading to Iquitos by boat. This is done through the port in Yurimaguas, located about 44 miles north-northeast of Tarapoto. Minibuses and shared taxis leave regularly from Tarapoto to Yurimaguas. It takes about two hours, with the first hour going along a winding route through the jungle-covered foothills of the Andes Mountain range. If you suffer from car sickness, you might want to mentally and physically prepare yourself for this particular section. Once you're in Yurimaguas, you can head down to the port to organize your boat trip from Yurimaguas to Iquitos, which takes about three days.